Join Dan and Tanya on one of the most scenic drives through the Canadian Rockies. 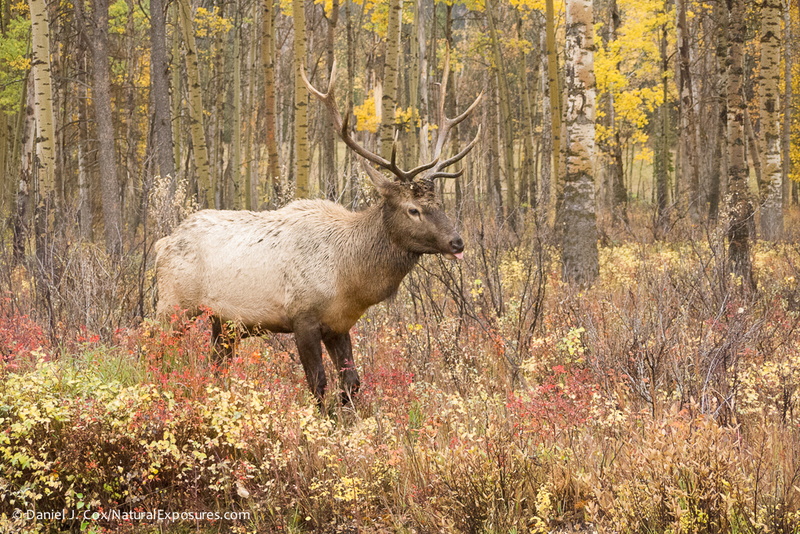 The autumn season is a magical time when the larches turn from green to gold along the rugged Continental Divide. Our small, private group will travel on a chartered, guided vehicle throughout Kananaskis Country and Banff and Jasper National Parks. Accommodations include the famous Fairmont Chateau Lake Louise and Canadian Delta Lodges. This would be a great trip for couples with non-photographing spouses—so close to home, and the best time of year to explore! The hoards of summer visitors are gone, the parks and animals are waiting for us—now is the time to enjoy this beautiful province! Note: We’ve added an extra night in Jasper! Rise and shine for an early morning sunrise shoot! We’ll check out at 6:45am and then work the back roads for many photo stops. At this time of year the scenery will be spectacular, with grizzlies gorging on buffalo berries and elk bugling and rutting. Although we can’t guarantee wildlife viewing, this area is prime habitat for bighorn sheep, moose, elk, black bears, grizzly bears, coyotes, deer, beavers, and mountain goats. And don’t forget your binoculars! In late September, you may be able to catch a glimpse of the golden eagles that ride the rocky mountain updrafts in Kananaskis Country during their annual migration. Morning snack bars will be available and a hot “camp style” breakfast will be prepared mid-morning in the field. Sunrise shoot and return to the hotel around 9:30am for breakfast. Check out by 11:00am. Picnic lunch today. For two nights, we have the luxury of staying in the heart of Banff National Park at the famous Fairmont Chateau Lake Louise. One of the perks while staying at Fairmont Chateau Lake Louise is that you’ll have the best views of the lake and Victoria Glacier through your room window or right outside the chateau! Dan will be lakeside at 7:00am for anyone who wants to accompany him exploring trails circling the lake. A full, scrumptious Fairmont breakfast is on the menu this morning—be sure to indulge before or after heading out to the lake! Adventurous guests can take the hike up to Lake Louise Agnes Teahouse, one of the most famous trails in Lake Louise and the Canadian Rockies. Situated at an altitude of 7,005 feet, the Tea House is located in a lovely hanging valley on the shores of Lake Agnes. After a forested 2.2 mile hike, the valley opens to reveal spectacular Lake Agnes. Together with Mirror Lake and Lake Louise, these lakes are often referred to as the ‘Lakes in the Clouds.’ Before you head back down, re-up your energy with a hearty homemade soup/sandwich, fresh baked goods, and a cup of tea—more than 100 teas to choose from! One last chance to catch the early light on Victoria Glacier, so pick up a quick coffee and danish from the Chateau Deli and head out for a sunrise shoot! In the afternoon, we’ll travel north toward Jasper National Park. We’ll drive through incredible scenery and stop frequently to photograph. The Icefields Parkway from Banff National Park to Jasper include a chain of massive glaciers with waterfalls that tumble down the Continental Divide. This drive is considered one of the world’s top 10 most scenic drives! You’ll notice many of the lakes have a peculiar color of icy blue water due to deposits of glacial silt. Early morning sunrise shoots scheduled. We’ll venture to the Maligne Lake area to work the roads—a scenic drive that offers potential for seeing a variety of wildlife including grizzlies, black bears, deer, moose, big horn sheep, caribou, and mountain goats. 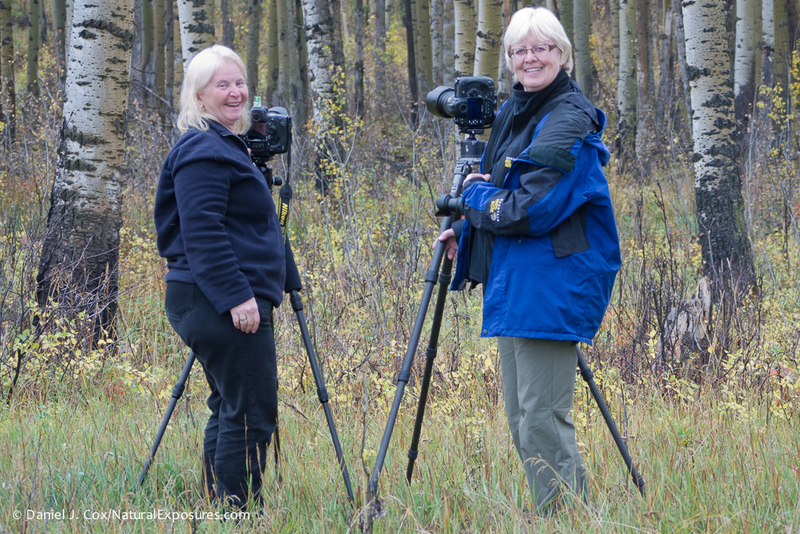 We’ll photograph the Colin Range from the Palisades picnic site and follow the Miette Hot Springs Road, a narrow and winding scenic road with four pullovers to stop and photograph. We’ll return to the lodge midday. In the afternoon you’ll have time to go out and have lunch and then download your images, relax, or photograph around the lodge area. Dan will be available for any questions you may have about digital storage or software programs. Depart Calgary anytime of day. Meet Dan and Tanya just outside customs/baggage claim at the Calgary International Airport at 1:30pm. Please fly in the night before if needed. Kananaskis Mountain Lodge Autograph Collection Hotels is a world-class resort in the heart of the Canadian Rockies. Located one hour west of Calgary, guests experience an authentic and comfortable retreat, nestled quietly amidst rugged terrain and breathtaking views. Serenity awaits throughout all newly renovated guest rooms & suites. Amenities include a full service spa, fitness center, pool, and complimentary in-room wireless Internet. Banff may be a small resort town, but with its rich history, outdoor activities and breathtaking scenery, it’s a worthy alternative to the big city. Nestled in the heart of town at the base of Sulfur Mountain, Banff Royal lodge offers the perfect location, surrounded by the majestic mountains, lakes, and forests of Banff National Park, a UNESCO World Heritage Site, making it easy to truly unwind. Relaxation comes in all forms, including a fitness center, mineral pool, and the full-service Grotto Spa. Sit down to a delicious locally sourced meal at Evergreen Restaurant and Lounge, or enjoy dining in the comfort of your guest room, featuring complimentary Wi-Fi, a 37-inch LCD TV, and a cozy Sanctuary bed. Rated “North America’s most scenic resort” time after time, the chateau offers lake view rooms and a variety of restaurants, lounges, a spa, and shops. After a full day of photographing the scenic drive from Banff to Lake Louise, you’ll have an evening to yourself to unwind and enjoy all the hotel has to offer. Before nodding off, don’t forget to set your alarm: the best light is on the lake in the morning! Wi-Fi and hair dyer available in rooms. Set amidst the breathtaking Canadian Rockies, the Sawridge Inn Jasper is a resort style hotel that offers true rustic charm. Beautiful guest rooms, on-site spa, decadent dining, and a heated pool with jacuzzi and steam room add to the luxury you want in your mountain getaway. Complimentary business station and Wi-Fi throughout the hotel. Located immediately within YYC, you are just steps from your gate, eliminating stress and maximizing efficiency. The city’s vibrant downtown district is just a short drive away. Contemporary rooms showcase custom duvets, 49-inch flat-screen TVs, and high-speed Wi-Fi access. Windows feature views of the Calgary skyline, the Alberta Prairies, and the Canadian Rocky Mountains; some also offer views of the airport runway. Enjoy a locally sourced meal at Yakima, the hotel restaurant and bar, or challenge yourself to a workout in the fitness center and pool. Each guest will receive a full itinerary with suggested camera gear, clothing, etc. closer to trip time. You are welcome to bring a video camera if you prefer this media format. Your passport must be valid at the time of entry, and one empty passport page is required for entry. No visa needed. Scenic photography is the focus of this trip; seeing wildlife is a bonus. We’ll do our best to get you to the right place at the right time during optimal light for sunrise and sunset shoots. There will be many early mornings and late evenings. Most of the outings are optional, so you can choose whether to go out with the group, stay back and get some rest, or explore on your own. This is your vacation and should be pleasurable! Many of the resorts/lodges have walking trails, spas, pools, etc. to relax and enjoy at your own pace. The activity level on this trip will be fairly non-strenuous. There will be hikes, but all are optional and most are fairly easy. Most photography will be done from the road. Our private chartered vehicle seats 30 people and has overhead storage and also luggage storage in the rear. Snacks and water will be available on the charter throughout the day. "Canadian Rockies - OH My! Glacial lakes for goodness sakes! A memorable trip in so many ways - food, sights, friendships and accommodations"